2006; 708 pages. Genre : Spy Novel. Author : anybody's guess. Overall Rating : B.
Robert Ludlum died in 2001, but five years later, using a ouija board and a magic marker, he communicated The Bancroft Strategy to his Estate. I know this, because his name is plastered on the cover of the book in huge, gold letters. Todd Bellknap is no Jason Bourne, but when his mentor and best friend in the Consular Operations agency is kidnapped, he is forced to go rogue to go to the rescue. Meanwhile, Andrea Bancroft suddenly finds herself 6 million dollars richer, with just one catch. She has to sit on the board of her estranged family's Bancroft Foundation. When their two paths inevitably cross, they have to learn to trust each other in order to track down the sinister and elusive "Genesis". It's the classic Ludlum storyline - one lone agent up against a sizable and mysterious conspiracy, on the run from his agency, and never knowing who's good and who's bad. There are lots of plot twists, lots of action, and lots of worldwide settings. The overall ending surprised me (although in retrospect, it shouldn't have), and at the very, very end, there's a neat little ethical twist that will make you smile. OTOH, the book is 700+ freakin' pages long. Where was the editor in all this? And if you've read one-too-many Bournish "one agent beats all the other trained killers in the world" books, you might find this a slow go. I'm as paranormal as the next guy. Okay, I lied. Despite the bookcover, Robert Ludlum didn't write TBS. In small print, on the credits page, it says, "Since his death, the Estate of Robert Ludlum has worked with a carefully selected author and editor to prepare and edit this work for publication." Most of the criticism of this book has to do with the authorship. Some people felt suckered in by Ludlum's name splashed across the cover. Others felt this was a poor copycat of the Bourne plots. Those points have merits, I guess. Personally, I enjoyed ths book, despite its length. Most people who read this genre know Ludlum passed away a while back, so one shouldn't feel duped. And if you can forget about the Bourne trilogy (all six books of it), and read The Bancroft Strategy for its own merits, it's pretty good. I even have some sympathy for the unknown author. He writes a good book, and no one will ever know. Hey, it could even be one of the 5-Squared writers. (Looks quizzically at the blog-members list). Hmmm. So...um...in your book list, I put the author as Robert Ludlum, I guess that'll have to do. Did the estate just edit/finish an unfinished mss? Like the way they did for the book Jane Austen was working on when she died (Persuasion)? I'd love to take credit for this, alas, I cannot. We like the Bourne movies, but haven't read any of the books. With my TBR, I don't think I'll get to them anytime soon. I'm curious how they got away with stealing his name. the "Ludlum Estate" (presumably his family)puts out all these after-death books. for Bourne 4-6, they hired Eric Van Lustbader to do the writing, and he gets credited on the bookcover, albeit in much smaller letters than Ludlum's name. 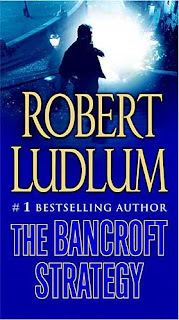 there is some hint that Ludlum had at least outlined The Bancroft Strategy before he passed away. but neither the book itself or Wikipedia confirmed this. then apparently the Ludlum Estate hired someone else to actually write the whole thing. just why said author didn't even rate his name in small letters on the cover is a good question. the Bourne books and movies go down different paths. Movie #1 roughly follows Book #1 and a bit of Book #2. after that there's no overlap at all. the movies are all about Action. the books are all about Intrigue, Conspiracy, and complex Plotlines. both succeed admirably. but judging from the reviews of both media at Amazon, the book-lovers won't necessarily like the movies, and vice versa. That's really strange. I can see why you didn't put him down as the author then. BTW, i had people show me the ropes on StumbleUpon yesterday. an interesting site.